If you want to find out more about the issues that affect our environment, this is where they’ll be. Whether it’s details of the latest asphalt plant, bio-mass plant or wind turbine application, we lay out the facts and let you share your opinion. 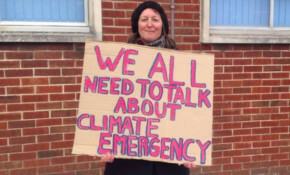 Inspired by Nobel Peace Prize nominee, Greta Thunberg, this Isle of Wight climate campaigner shares her story about why she's been outside County Hall every day this week. The Asian Hornet has to potential to decimate the Island's bee population in virtually no time at all. See a real Asian Hornet, set in resin, this Saturday so you can identify and report it if you see one coming out of hibernation. Local woodcarvers and heritage experts will all be involved, as they work to bring the site at Merstone's former station back to life. A group of young people at Ryde School - who work hard to raise awareness of environmental issues - recently teamed up with Isle of Wight small business, Wyatt and Jack, to collaborate on a project aimed at reducing what goes into landfill. This Isle of Wight councillor says Islanders "need to rise up and demand legislation, so we control our own housing, environmental and economic needs" and not be dictated to by "blinkered politicians". With global warming high on the national agenda after last week’s Youth Strike 4 Climate, Cowes Enterprise College played its own part in spreading an important message of social awareness when sixth form pupils designed a lesson delivered to every single class.